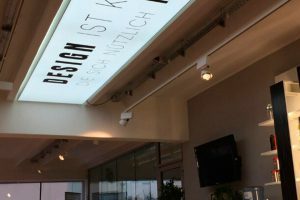 Multi frame side light LED light boxes can be used single or double sided, free standing, wall mounted or suspended The LED light boxes work with side illumination – LED modules and the drivers are built in the frame on two opposite profiles. The biggest distance which can be lit in this way evenly is 300 cm / 118”. 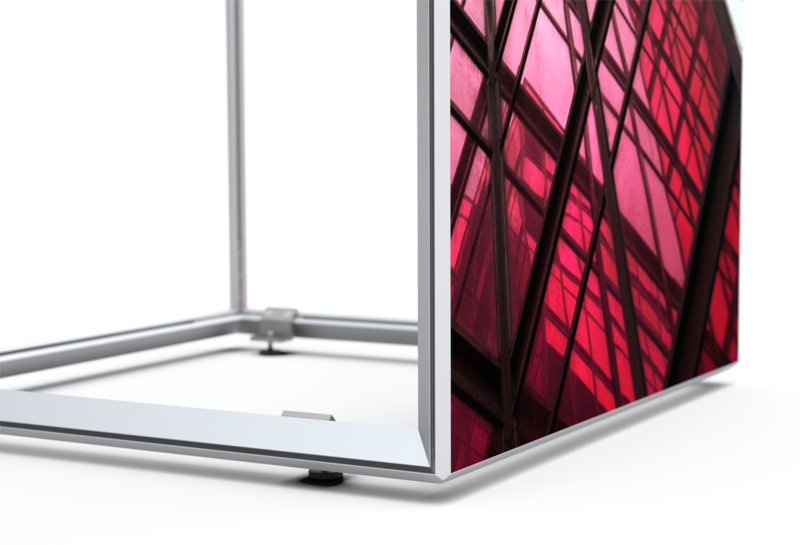 Therefore 300 cm / 118” high or long light boxes can be built. Theoretically the length / height is endless. The graphic panel is attached with a silicon lip/edging that slides into the frame making it quick and easys to change the graphic panels. 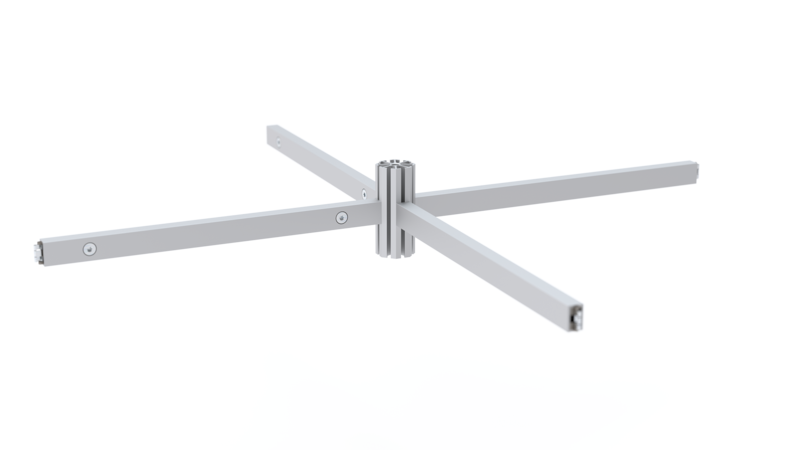 Three different profile dimensions (depth) are used to build different frame sizes – 80, 120 and 160 mm / 3.2”, 4.7” and 6.3” are available. muli frame frame light boxes can be suspended from the ceiling. 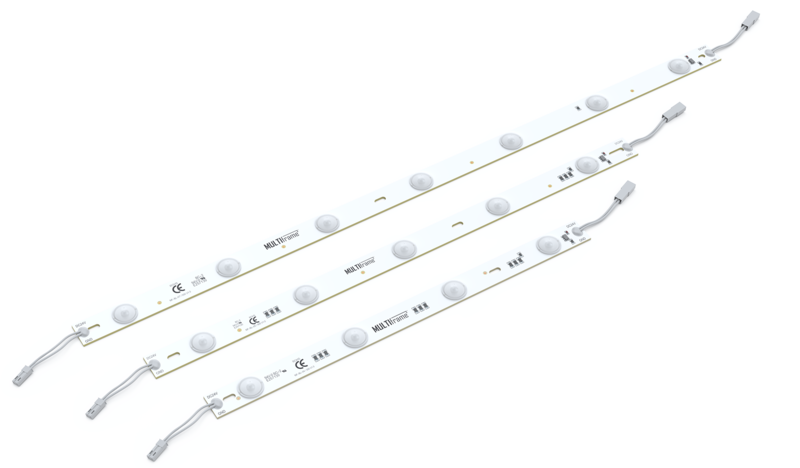 The modular design of the LED modules allow us to backlight almost any frame size with an even, bright light with no hot spots. The perfect combination of LED and lens guarantees the absolute even lighting and brightness without any shadows. Upon request even the brightness of the LEDs can be adjusted (dimmable). Multi frame side light frames are energy saving but still come with a very bright and even lighting. Frames can be delivered in parts. This safes transport costs and packing material. Assemble the frame, connect driver and cables – plug it in and finished. 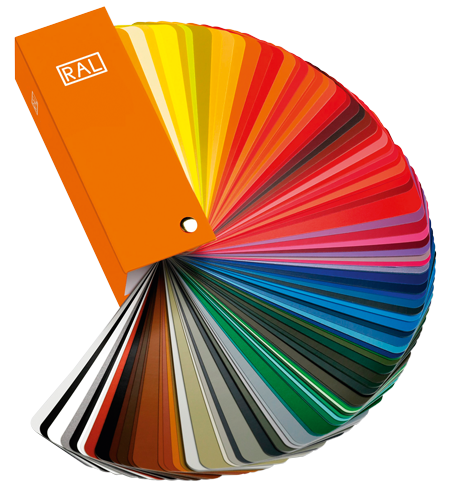 Different RAL colours are available upon request (powder coating). 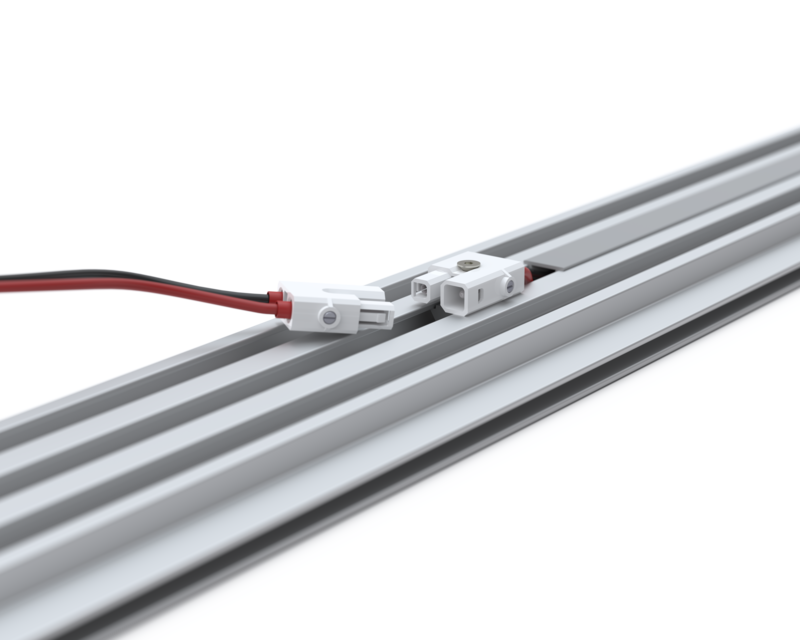 Multi frame super slim frames 35 and 65 are LED frames with a frame depth of only 35 or 65 mm / 1.4” or 2.6”. The frames are perfectly designed for wall mounting. 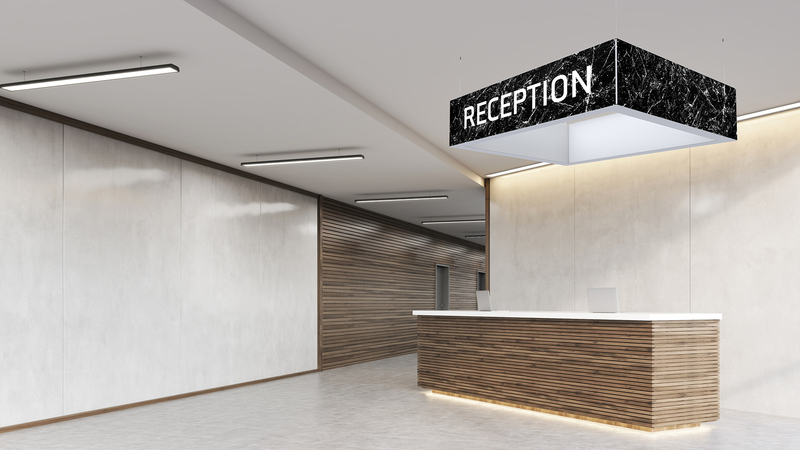 These frames are built to last, using high quality materials and manufacturing to ensure a durable and long lasting display frame. The special dimension of the lens of the LED module prevents hotspots and achieves an even, bright light across the display with no shadows. Two different profile dimensions (depth) are used to build different frame sizes – 35 and 65 mm / 1.4” and 2.6” are available. 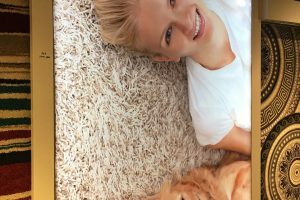 Using high quality OSRAM LED technology in combination with a perfectly adjusted lens the following results can be achieved: approx. 7000 lm, approx. 45 watt/m2, approx. 1600 cd and colour temperature 6000 Kelvin. Above data show that multi frame Super Slim 35 / 65 frames which are primarily used to backlit pictures can also be used just for lighting too.The modular design of the LED modules allow us to back light almost any frame size with an even, bright light with no hot spots. The perfect combination of LED and lens guarantees the absolute even lighting and brightness without any shadows. Multi frame super slim frames 35 and 65 are very thin/slim – 35 / 65 mm / 1.4” / 2.6” depth – LED frames. Upon request even the brightness of the LEDs can be adjusted (dimmable). Multi frame Super Slim – 35 / 65 frames are energy saving but still come with a very bright and even lighting. 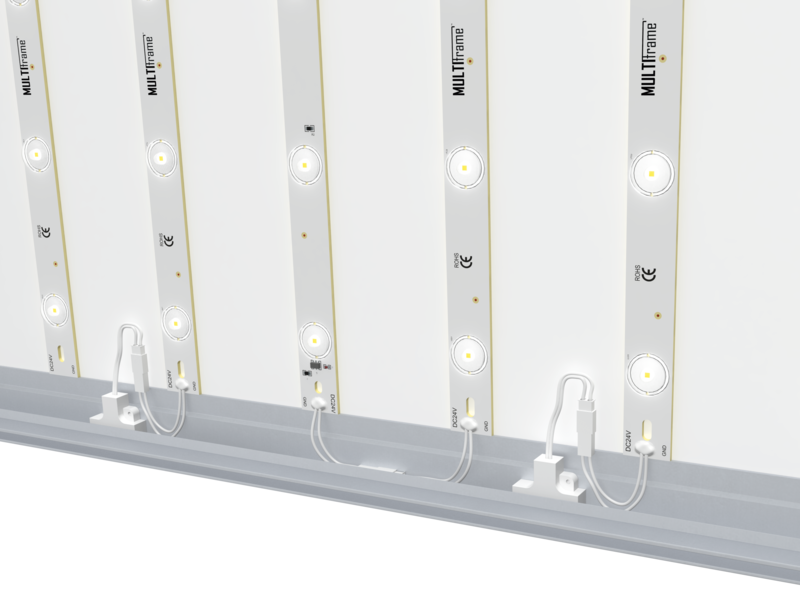 Our LED modules come with a special cable system which can be hidden in the slots of the aluminium profile in the frame. Therefore we achieve even lighting without any shadows. Frames up to a size of two square meters come pre-assembled (depending on length X width of the frame). 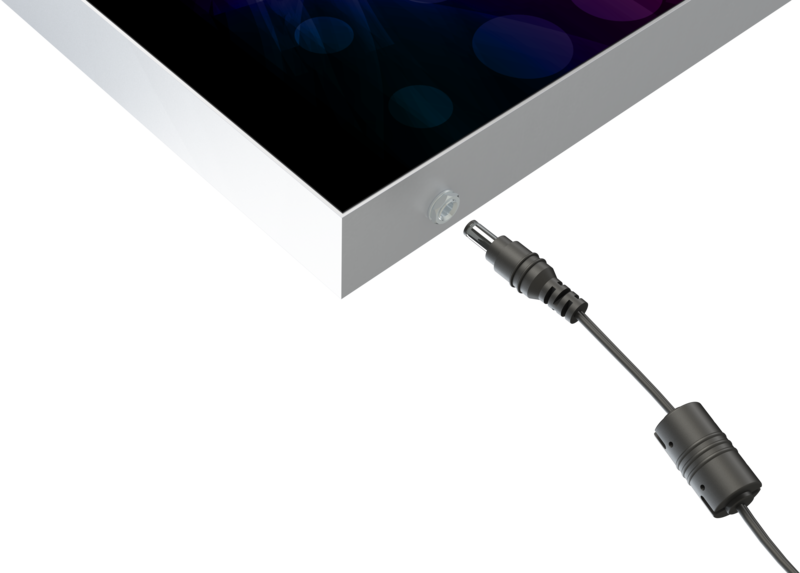 Just connect frame, driver & cables – plug it in and finished. 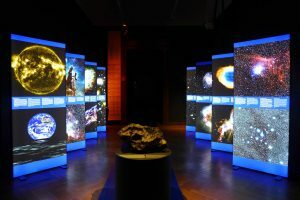 Multi frame backload LED light boxes can be used single or double sided. For stability reasons backload is often used with large formats. The special design of the profile allows that you can change graphics from one side. You open the back side/take off the print and then you are able to take out the front print/picture from behind. 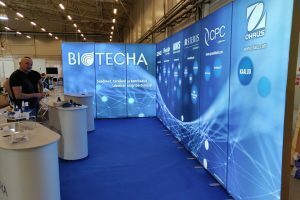 One profile – profile dimension (depth) 160 mm / 6.3” is used for this display frame. The multi tower 3D silver anodized aluminum profile was specially designed to create cubes, towers and walls that are easily backlit with LED lamps and are easily transportable. 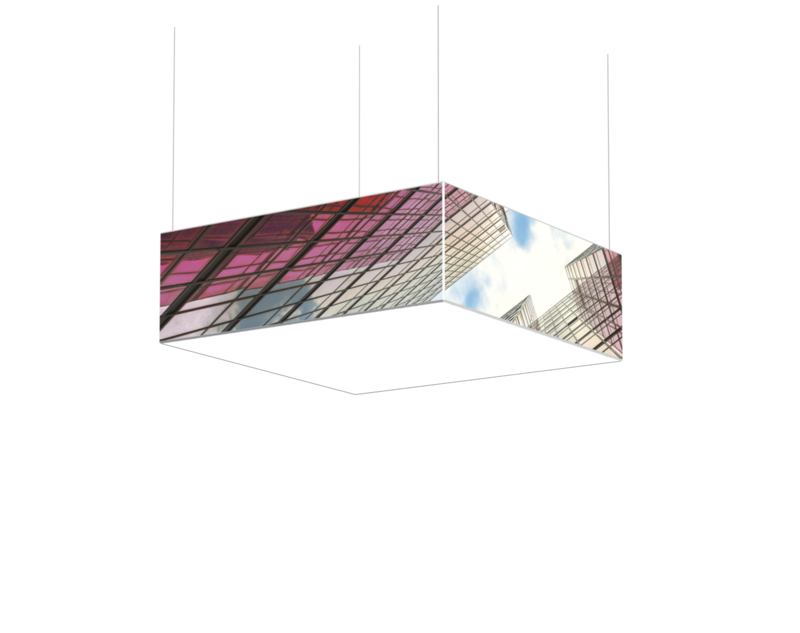 Thanks to the light weight constructuion ceiling suspended cubes can be constructed. 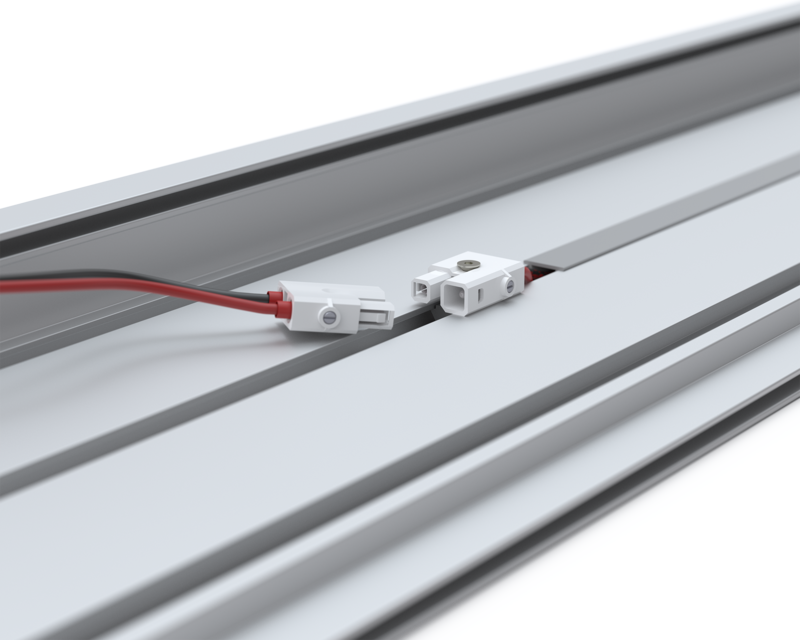 The advantage, compared to similar products, is the 90° profile slot. The fabric is pushed 3 mm into the slot and only then tensioned around the corner. This technique helps to preserve the fabric as it prevents it from overstretching. We offer LED Lamps – E27 100-240V, 12 watt, 1200 lm (comparable to 100 watt light bulb) 310° light angle. 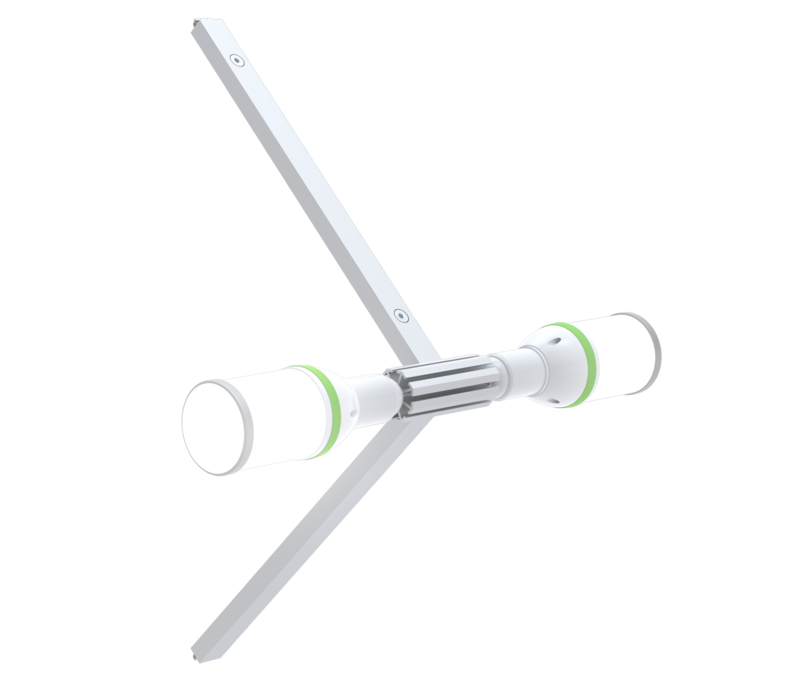 Joints on the straight profiles are reinforced with an aluminium cross that can also be adapted as a lamp fitting for LED lamps. This technique allows for an even illumination without any shadows. 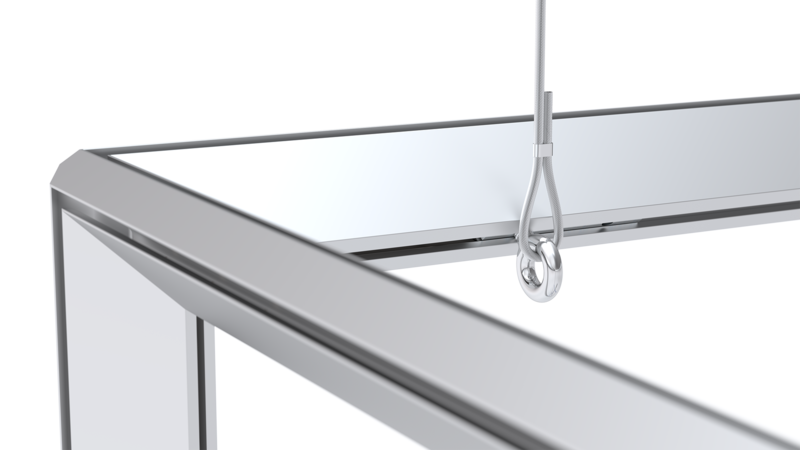 Multi frame tension frames can be suspended from ceilings. 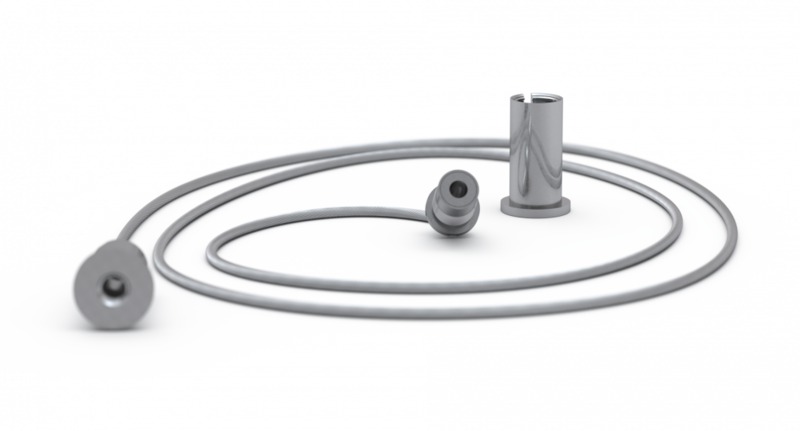 All necessary parts such as steel cables, eyebolts etc. are available as accessories. Different colours are possible upon request (powder coating).